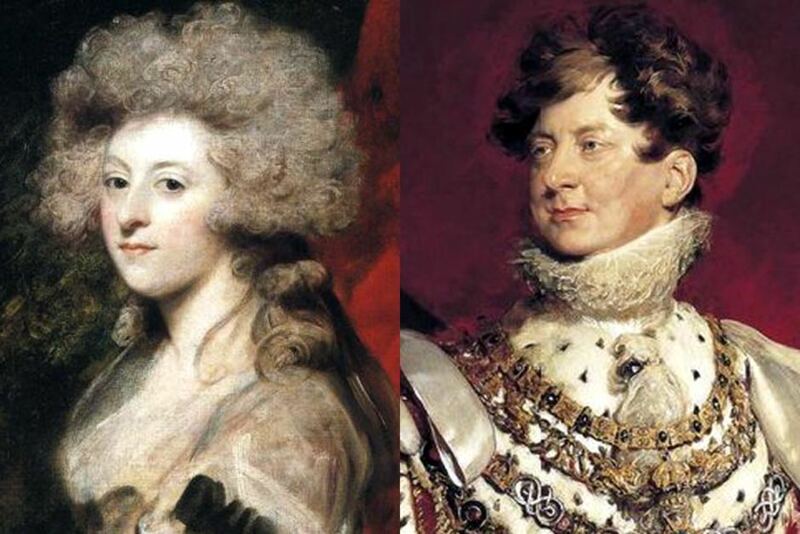 It was the spring of 1784, and the young crown prince of England, George IV, was up to no good. Out of the drama of his love life came a trend that spread amongst the fashionable set - having a tiny portrait painted of your lover's eye or eyes, to be worn discreetly as a brooch or pendant. "Eye miniatures" as they were known in the Prince's day, or "lover's eyes" as we call them now, were a fad throughout the late 18th and 19th centuries, but sources have it that fewer than 1000 of them still exist today. We are selling three fine antique examples in our Important Spring Auction. The most prominent gentleman on the London social scene by age 21, Prince George IV had, in his own words "become rather too fond of women and wine." His friends called him "Prinny" and his father, King George III, had his doubts that Prinny would ever be serious enough to take over the throne. And then one spring night, Prince George went to the opera. There he met a young woman, attending with her uncle, as she was already twice-widowed at the age of 26, who stole his heart in dramatic fashion. Unfortunately for the Prince, Maria Fitzherbert was Catholic, not Anglican, which was a requirement for anyone marrying into the royal family. George would never get his father's consent to marry her. Nonetheless, Prince George threw himself into courting Maria for the next few months. She was having none of it. Finally, in June of 1784, George staged a suicide attempt - he pretended to stab himself and told Maria that if she didn't agree to marry him, he would kill himself. Maria relented then and accepted a ring, but shortly thereafter, likely realizing that their marriage would be illegal, she fled to France to escape the Prince's ardor. George persisted. He pleaded with her from afar to come back and marry him, and famously sent her yet another proposal and ring, along with a tiny portrait of his eyes. The eyes may have had it - Maria came back to England and married the Prince in a secret ceremony in her home. They remained secretly married for nine years, until the Prince had accumulated so much debt that he was forced to throw himself on the mercy of Parliament, who required that he leave Maria, (their marriage, never approved by the King, was illegitimate anyhow) and marry his first cousin. The story goes that it is from this dramatic tale of royal love that the popularity of lover's eye jewelry spread, and lasted well into the 19th century - Queen Victoria commissioned a number of lover's eye pieces. The tiny eye portraits were a way to create intimacy between lovers, spouses, and close family members in an era when public displays of affection were frowned upon. Some say that they were a way for those conducting an illicit affair to quietly profess their secret love without giving away their lover's identity. That said, one wonders if the eye portrait itself, while not revealing its subject's whole face, would have inconveniently signaled indiscretion. A wife, for instance, might wonder whose eye her husband had pinned to his lapel. Regardless of their actual usefulness in keeping affairs secret, the lover's eyes were also unquestionably worn as tokens of mourning. Sometimes commissioned by the soon-to-be-deceased and bequeathed in their will, the jewelry might include an inscription of the name and date of death of the loved one whose eye was depicted. The lover's eyes were a popular way to commemorate spouses or children who had passed away. The brooch below carries a name and date, perhaps of death, and the decoration of the serpent swallowing it's tail, or "ouroboros," signifies both infinity and the cyclical nature of life and death. There are a number of the remaining lover's eye pieces in museum collections around the world, including the Metropolitan Museum of Art, the Victoria & Albert Museum, and the Philadelphia Museum of Art. While it is nearly impossible to identify the subject of the eye portrait in most cases, they are a wonderful window onto the sentimentality of the Georgian and Victorian eras.